OK Jaanu (transl. Ok darling) is a 2017 Indian Hindi-language romantic drama film directed by Shaad Ali, with story and screenplay by Mani Ratnam. Produced by Mani Ratnam and Karan Johar under their banners Madras Talkies and Dharma Productions respectively. It is a remake of Mani Ratnam's Tamil film O Kadhal Kanmani, starring Dulquer Salmaan and Nithya Menon. The film stars Aditya Roy Kapur and Shraddha Kapoor, portraying a young couple in a live-in relationship in Mumbai with Naseeruddin Shah and Leela Samson playing supporting roles as an older couple in the film, portraying the younger couple's landlords. Eesh Kakkkar plays Tara's ex-boyfriend. A. R. Rahman composed the film's score and soundtrack. Gulzar has written the lyrics and the dialogues for the film. Adi (Aditya Roy Kapur) is a video game developer who accidentally meets Tara (Shraddha Kapoor) at his friend's wedding. Tara is planning to pursue her architectural studies in Paris, while Adi wants to achieve big in the United States as a video game developer and become a big shot like Mark Zuckerberg. They soon spend time together, and fall in love. They agree that marriage is not for them and decide to have a live-in relationship instead, and Tara moves into Adi's place, rented from Gopi Srivastava (Naseeruddin Shah). They wish to spend their time with each other before they go their separate ways for their respective careers. Tara and Adi live happily, being playful with each other. One early morning, Tara has a conversation with Gopi. She tells him that she might get her visa approved for going to Paris, and that it's hard for her to leave Adi and go far away. The next day Tara goes to Jaipur for her business, and Adi starts to miss her terribly. Upon seeing the love and patience his house owner Gopi has for his wife, Charu (Leela Samson), an Alzheimer's patient, who eventually forgets the way to her own house, they begin to understand the importance of each other's presence in their life. Soon, Adi is selected to develop his skills in video games and to go to the United States. He tells his colleague that it's hard for him to leave Tara. The next day, both of them make an agreement to enjoy themselves to the maximum for the 10 days left before they separate. Nearing the last day, they begin to have little fights and arguments, which don't last long. One day, Charu goes missing again, as she did when she forgot her house address. While looking for her, they continue arguing about their relationship and after finding her and bringing her back home to her husband, Adi finally proposes to Tara and they decide to get married. Post marriage, both of them continue to accomplish their own dreams, one in Paris, another in the United States, keeping in touch and waiting for the day they can be together again. The film score and soundtrack are composed by A. R. Rahman while the lyrics for songs are written by Gulzar. Rahman re-used most of his compositions from the Tamil soundtrack of O Kadhal Kanmani, with the exception of three songs. He composed two new songs for the film which are the Hindi counterparts of "Aye Sinamika" and "Malargal Kaetten" that were part of Tamil version. The Hindi counterpart of "Parandhu Sella Vaa" is a cover version of Rahman's yesteryear classic "Humma Humma" from the 1995 Tamil movie Mani Ratnam's Bombay. Dubbed as "The Humma Song", the cover was done by Badshah and Tanishk Bagchi. The full soundtrack was released by Sony Music India on 4 January 2017. The film grossed an estimated ₹41.04 crore (US$5.7 million) worldwide, with approximately ₹32.83 crore (US$4.6 million) earned domestically, and ₹8.21 crore (US$1.1 million) from international releases. Bollywood Hungama rated the film 2.5 out of 5 stars, stating that it is "a decent love story which works only in parts mainly because of the chemistry between Aditya Roy Kapur and Shraddha Kapoor." Writing for Hindustan Times, Anupama Chopra rated the film 2 out of 5, commenting, "This is just a pointless film, because an exact frame-for-frame version already exists in Tamil", referring to O Kadhal Kanmani, directed by Mani Ratnam. Chopra described Kapur and Kapoor as "too lightweight" to bring a comparable depth to the characters that the original actors did. ^ "Ok Jaanu - Box office India". Box Office India. ^ "Box Office: Worldwide Collections and Day Wise breakup of Ok Jaanu". 14 January 2017. Retrieved 17 February 2017. ^ "Shraddha Kapoor, Aditya Roy Kapur cosy up in 'OK Jaanu' first look". Retrieved 3 March 2016. ^ "Ok Jaanu Movie Reivew". Retrieved 12 January 2017. 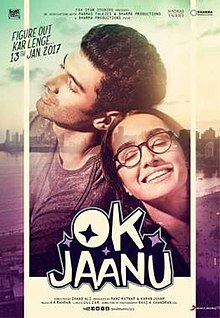 ^ "Review: Shraddha and Aditya Shine, but OK Jaanu Is Strictly 'OK". ^ a b c d "ARRahman composes three new songs for Ok Jaanu remake of O Kadhal kanamani". indiaglitz.com. 26 May 2016. Retrieved 28 May 2016. ^ "Box Office: Worldwide Collections and Day wise breakup of Ok Jaanu". BollywoodHungama. 24 December 2016. Retrieved 14 January 2017. ^ "Nominations - Mirchi Music Awards 2017". MMAMirchiMusicAwards. Retrieved 13 March 2018. ^ "Winners - Mirchi Music Awards 2017". MMAMirchiMusicAwards. Retrieved 13 March 2018. This page was last edited on 31 March 2019, at 07:10 (UTC).